Ministry of Propaganda - 26/Nov/2006: "Sunday Afternoon Stroll"
Unfortunately the weather forecast got it the wrong way around today: Instead of it being nice in the afternoon and fairly wet in the morning it was pretty much the other way around. 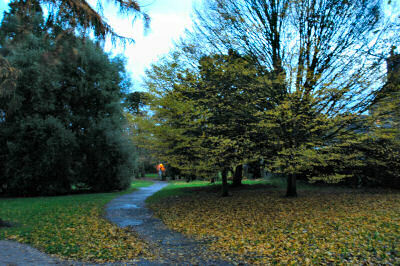 So I just went for a short late autumn afternoon stroll through the parks here in Old Town Swindon today. 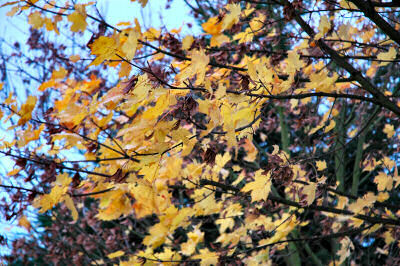 Most of the leaves have now fallen, only the odd pocket here in there still on the trees. Some just outside of my house, as seen in the first picture. They would have looked much nicer in some sunshine, but there wasn't much of that around this afternoon. Some rain was falling while I walked along the old rail track and through Town Gardens, not much, but enough to pull up the hood of my jacket. From Town Gardens I crossed through Old Town to The Lawn, the clouds occasionally breaking up. Some reasonably nice autumn impressions at The Lawn, unfortunately the light was failing now and I didn't have my tripod with me. Holding the camera steady for a full second or two was a bit too much and there weren't any opportunities stabilise the camera on a pole or similar. Hopefully the weather will be better next weekend and I'll get out for a longer walk then. There will also be a guided walk from Banbury Castle on 10/Dec/2006, I hope details will soon be listed on the Swindon Council Ranger Events page. I'm planning to join that walk, should be interesting.